11th May 2016 - Mustang, Oklahoma to Shawnee, Oklahoma. We had been very worried about the weather here in Oklahoma – so even though a shortish day today we decided to be up and away as soon as possible. My original plan had us down for a 65 km ride today, but changing to this more southerly route had added to the distance and we had about 80 kms to go today. The plan for the ride looked really straight forward - continue along 152, a bit of I-44, then a fair distance on the I-240 which would lead onto the I-40 – until we would take exit 181 into Shawnee. It all sounded very simple and straight forward …………. but in practice it was a nightmare. This is our second "short day" of the trip - the one from Williams to Flagstaff turned into a nightmare because of the sow, thunder and lightening - and this day became one too - but for different reasons! The 152 grew busier and busier and I guess we were riding at a time when commuter traffic was heading for Oklahoma City. 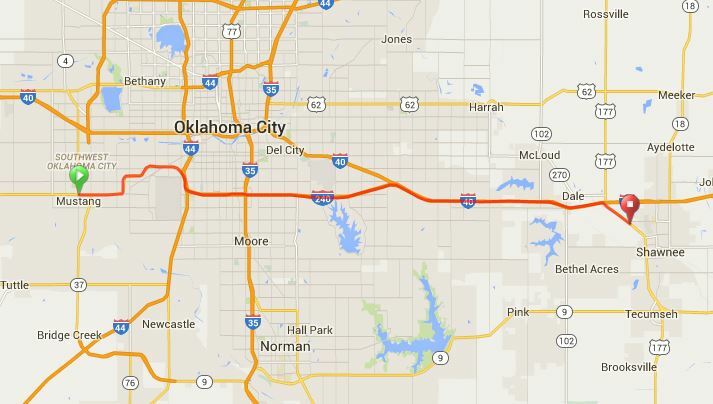 I thought as we were heading directly east we would really be crossing most of the traffic heading north into Oklahoma City, and the short distance of Interstate 44 (about 1 mile) that we had to be on heading in a southerly direction would also be against the flow of the main traffic - WRONG. As well as battling directly into a head-wind this part of I-44 seemed to be a MAJOR intersection so traffic was whizzing in all directions. I re-iterated to Don and Annie that we had to take real care and walk across on / off ramps if necessary - but to be really careful. My famous last words were that it wasn't far until we got to the "240" and that should be better!! The 240 – turned out to be the busiest stretch of road I have EVER ridden on - and I have been on a fair few roads in different countries!! It was a freeway of fast moving traffic with off and on ramps more frequent than I have EVER seen before. Each off-ramp immediately followed by an on ramp, they seemed to be about every quarter mile!! Traffic often didn’t indicate they were exiting – so we frequently got off to walk to remain safe. It truly was a nightmare – but we were caught in the “go on” or “get off” thought pattern. I just wanted it over as fast as possible - so we continued!! Pat did a good job behind us with hazard lights flashing on the van which I am sure slowed some drivers down and offered us some protection - but the motorists here didn't really want to slow down for anyone and just rushed, pushed and shoved their way along. It seemed to go on forever, but when the chaos subsided and we were finally in rural surrounds with decent spacing between exit and entry ramps - my speedo showed we had covered a total of 40 kms. It hadn’t been a pleasant experience at all. Would the I-40 have been busier??? Hard to imagine it could have been and it would have been shorter!! So glad to have that over we looked for signs for a coffee stop - but despite seeing several earlier, they seemed to have disappeared. We did find a little service station to take a most welcome break at and try to regain our shattered nerves! We continued on the 240 from there without incident and a whole lot less traffic. When we joined the I-40 I thought it would be busier, but in fact was not significantly so, mush to my delight. Before too long - exit 181 showed up and we were off on to the "177" to head to our stop for the night - about 5 miles away. It was just on midday and we were about 2 miles from our stop at Shawnee. The weather had started clouding over and I had received storm warning alerts on my phone for the area. The Shawnee Equestrian Exhibition Center was allowing us to camp in their campgrounds, but with the weather warnings out, we were thinking a motel would be preferable but we would see what facilities they had before deciding. We heard a “toot-toot” from behind and it was Pat in the van trying to attract our attention. I went back – and then she recounted her recent big fright!! She had been parked on the “shoulder” of the 177 – with all the vehicle to the right of the solid white line - well off the road. She also had the hazard lights flashing. She picked up the camera to take a photo of us – and suddenly BANG! !- and- then something flew across the front of the car! She thought – what the hell was that and looked back in her rear-vision mirror to discover that it wasn’t there!! The thing that flew across the front of the car was the broken off mirror. She noted a truck had gone by closely and that it swerved back out on to the road and continued on!! She caught up to us, and told us this story – and we had to decide what to do!! The storm was closing in so we decided to continue to the Shawnee Expo Centre and get accommodation sorted out. Then, as it is impossible to drive a van of that size without a rear-vision mirror we would try to find a Ford dealer and get it fixed! Hopefully she could take great care and get to the grounds. A worrying time as Pat was quite shaken by the incident. We cycled on – found where we were to stay –which was a largely unprotected area but we could camp as close to buildings as we wanted. With a 90% chance of hail and gale force winds, and in our minds probably a tornado, and now with the need to get the vehicle fixed – we opted to take a nearby motel. Then Pat rocked up – with some unbelievable news. A woman following the truck saw what happened – noted that he didn’t stop (a "felony" she said) so she set off in pursuit of it!! She had returned to Pat and said she was prepared to be witness, provided the business name of the truck, an excellent description of the driver (clothing, hair colour etc) and a US DOT number. She also said the vehicle should have been displaying a “Tag Number” but wasn’t – which is also a "felony"!! This lady must have been a detective, surely - but if not she was certainly a wonderful citizen - and our angel for the day!!! Immediately after checking into the motel – Pat and I headed to Ford. While Pat dealt with the service department - I took on ringing the company of the offending vehicle. Ford Shawnee found 1 only mirror available in Oklahoma and they listed it as urgent and said it would be delivered by 5:00 pm. The Courier Company listened to my story and said they would get back to me, which they did in very short time while we were still at Ford. I put them on to the Service Manager and they have agreed to pay for the repair. The manager booked the van in for the job to be done at 7:00 am the next morning, and we took the opportunity to get a service done as well which was agreed with Escape when we picked up the van. We wondered if we should report the incident to the police. The Service Manager said the company had been good about agreeing to come down and pay – so they were happy about that and we left it at that. So all in all - an exciting and nerve-wracking day for us all. Of course - a bottle of Toi Toi Marlborough Sauvignon Blanc needed to be downed with dinner to calm us down. We wandered across the road to another very disappointing "Kickapoo Casino" - great name. Thought we may have been able to get a nice meal - but it was really just a big shed with poker machines in it, patrons smoking, that served drinks and counter meals - burger and fries - extremely uninviting!! As well several beggars outside who probably had blown all they had in the casino. We did get a meal there, but as a take out, as we felt too buggered to drive anywhere else that day - and while not a storm as such yet - it was getting closer! ​So what a day!! Last time I will predict that short days will be easy!! !